We walked into the Old City of Jerusalem for a High Mass at the Tomb of Christ. Yup, what a treat! I was able to secure the High Mass so that my pilgrims all sat with the Franciscans immediately in front of the Tomb for a 45 minute Mass presided over by Fr. Steve Burr and Fr. Bernie Fraser. Even the video cannot show the emotion, the sense of awe and the personal touch of God at this Mass. The Church of the Holy Sepulchre has a powerful pipe organ. With the pipes blaring, Franciscans singing, and all the other wonderful sounds reverberating through this one-of-a kind place on all the earth. This is the place where the 2nd Person of the Trinity, God himself died and was buried and rose again on the third day. Words cannot describe . . . .
After Mass we took a group picture on the steps to the right of the entrance, then back to the Notre Dame for breakfast. We boarded the bus at 9:30 AM and headed south to Bethlehem. We passed through the Security Fence, the huge concrete wall, all arrived at the shop. Everyone had been chewing at the bit to get some shopping down so here I promised them we could "shop ‘til you drop." It is a Christian shop called Nissan Bros. and it helps support 63 Christian families in Bethlehem. After my friend Ephrem the own recited the Our Father in Aramaic, the language of Jesus, everyone bought olive wood gifts and all sorts of religious items. Then through a gauntlet of street vendors and went to the Christmas Tree Restaurant run by three Christian brothers for a delicious lunch “Bethlehem Fast Food Lunch” of Falafil or Swarma sandwiches packed into pita bread. Then to the Church of the Nativity. How does one process the profound importance of this site? As we processed into the grotto under the Church where Mary gave birth to Jesus and laid him in the manger — how can you really grasp the depth of the mystery, where time and eternity met, where God was revealed to the world as a helpless baby. Born of a mother without a father, he was Son of the Father without a mother. Creator of the universe, He now became part of that very material world. After the Church of the Nativity we drove across a small valley to Shepherd’s Field where the angels sang on Christmas Eve to notify the shepherds of the birth of Jesus. Why were the Shepherds the first to know of the birth of Jesus? Shepherds are always the first to know of the birth of a lamb—Jesus the Lamb of God. After doing a live interview by cell phone with Teresa Tomeo of Catholic Connections, we then visited the Shrine of the Book which is devoted to the Dead Sea Scrolls. We had some free time back at our hotel and then a delicious dinner before going to bed for an early start tomorrow. Some of the more hearty souls took off to explore the Old City after dark. Want to Join us on a Pilgrimage? Holy Land Pilgrimage with Steve & Janet Ray, Teresa Tomeo AND Immaculee Ilibagiza! Hear our new radio advertisements for this pilgrimage, click here for English and here for Spanish. From April 1- 10, 2008 Teresa Tomeo (Catholic Connections Radio Show) and I will lead a group of pilgrims to the Holy Land. We have a special host going with us — Immaculee Ilibagiza, author of the New York Times best-seller "Left to Tell." Immaculee is a world-renowned writer, international speaker and Catholic survivor of the genecide in Rwanda. Click here for the 4-page brochure. For more information or to register in advance, contact Corporate Travel at sparran@ctscentral.net, or call 313-565-8888, extension 121. Want to join us? This pilgrimage will fill up quickly, so act fast. 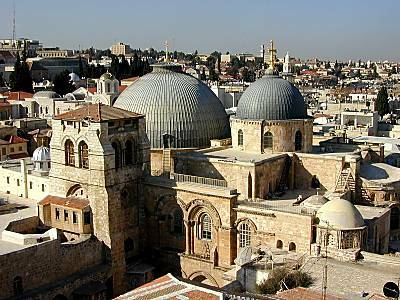 We also have a few seats left for our November 2007 pilgrimage to Israel and Jordan. Are you SURE this is the Place Christ was Buried? Many times pilgrims enter the dark Church of the Holy Sepuchre for the first time with this question on their lips. 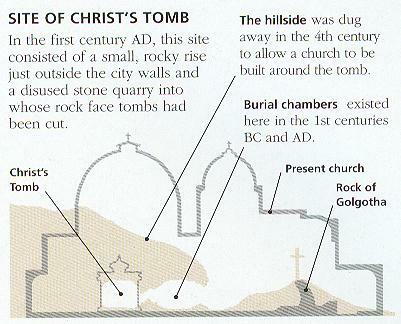 We are told that Jesus was crucified OUTSIDE the gates (Roman law) and buried in a new cave in a garden in a hillside. But when you walk into the Church of the Holy Sepulchre, it doesn't look like this at all. What you see are stone pillars, dirty, uneven flagstone floors, dark hallways, stairs going "hither and yon," oil lamps burning and black soot all over teh ceilings. Crowds jockey around the various rooms. You hear a cacophony of sounds as various Christian traditions are chanting in their own languages and guides are talking to their groups. How could this Church be the place where Jesus was crucified, buried and raised from the dead? It is inside the city walls and certainly doesn't look like a garden?. It was not inside the city walls in the time of Christ, and the Church was built over Golgotha and the Tomb. I found this diagram of the Holy Sepulchre Church so you can see the overlay — what it looked like then and what it looks like now. This illustration came from an excellent book and I recommend it highly, especially for those planning to visit the Holy Land. You can see the latest edition of Jerusalem & the Holy Land on Amazon.com. For my past blogs on the Holy Sepulchre, click here. To see a video of our March 2006 Mass in the Holy Sepulchre, click here and scroll down to Day 5. You will also see our trip to Bethlehem. If you want nice computer wallpaper from the Holy Sepulchre, click here.